Music has been around since ancient times. It is part of every known culture. It can get your foot tapping, lift your mood, and even help you recall a distant memory. Did you know that music can bring other health benefits? Scientists are exploring the different ways music stimulates healthier bodies and minds. “When you listen to or create music, it affects how you think, feel, move, and more,” says neuroscientist Dr. Robert Finkelstein, who leads the National Institute of Health (NIH) music and health initiative. “Today, modern technologies are helping researchers learn more about how the brain works, what parts of the brain respond to music, and how music might help ease symptoms of certain diseases and conditions,” he explains. The brain is a complex processing hub. It’s the control center of your nervous system, the network of nerve cells that carry messages to and from your body and the brain. A healthy brain tries to make sense of the world around you and the constant information it receives, including sound and music. Music affects more than the brain areas that process sound. Using techniques that take pictures of the brain, like fMRI, scientists have found that music affects other brain areas. When music stimulates the brain, it shows up on brain images as flickers of bright light. 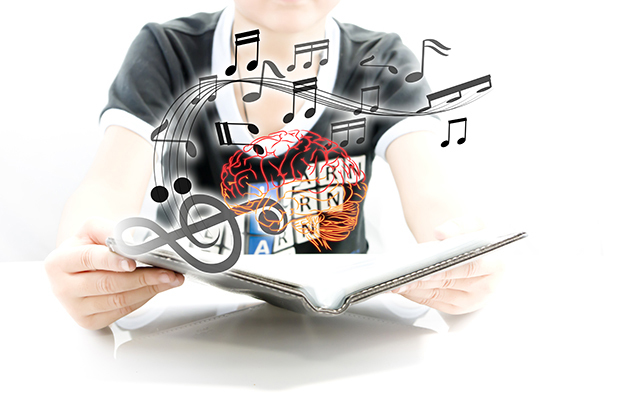 Studies have shown that music “lights up” brain areas involved in emotion, memory, and even physical movement. “Music can help facilitate movement,” Finkelstein explains. NIH-funded scientists are investigating whether music can help patients with movement disorders, like Parkinson’s disease. Patients with this condition slowly lose their ability to walk and move over time. “Studies show that when a certain beat is embedded in music, it can help people with Parkinson’s disease walk,” Finkelstein says. Another study is looking at how dance compares to other types of exercise in people with Parkinson’s disease. There’s also evidence that music may be helpful for people with other health conditions, including Alzheimer’s disease, dementia, traumatic brain injury, stroke, aphasia, autism, and hearing loss. Music is useful in reducing stress generally but can also be therapeutic in times of crisis and increased agitation. Listening to music specific to an individual with dementia can tap into memories and personality traits that may have long thought to be forgotten. This helps promote a newfound sense of self-worth and belonging as well as maintaining brain function as long as possible. Music can offer many health benefits, but it may not be helpful for everyone. Traumatic injuries and brain conditions can change the way a person perceives and responds to music. Some people may find some types of music overstimulating. Others may find that certain music brings up emotional or traumatic memories. As scientists continue to learn more about music and the brain, try striking a chord for your health. Whether you’re looking to boost your mood, stay connected to others, or improve symptoms of a health condition, add a little music to your life. Think of music like physical fitness or what you eat. To see the most health benefits, try to include music as a regular, consistent part of your life. It’s never too late to add music to your life. Welbrook at Bloomington is a new, state-of-the-art senior living community located at 1402 Leslie Drive in Bloomington. They offer independent/assisted living and memory care. “Living life well” at Welbrook means having the support, care and compassion to continue a lifestyle with just a change of location. For additional information, contact Rochel Yerington, Community Relations Director at 309-603-2700 or visit WelbrookBloomington.com.